Concrete you can place your Betts on! Betts Concrete Inc. takes pride in providing a full scope of concrete pouring services to residential and commercial customers throughout Eagle Creek, OR and the surrounding areas of Oregon and Washington. Our licensed, bonded and insured experts take pride in a job well done, regardless of the type or size of a project. Contact us today for a free estimate! When you need concrete poured to meet your exact specifications, Betts Concrete Inc. is prepared to deliver. We’re the local leader among concrete companies in Clackamas County, OR, providing services to both residential and commercial customers alike. 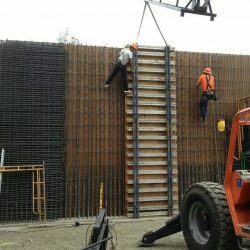 From simple sidewalk and slab pouring to more complex retaining walls and concrete stamping, our team delivers the complete range of possibilities, and all are held to the highest standards of quality. We know that quick, thorough work is our clients’ top priority, so we’ve made it ours as well! Using the best equipment and tools, our dedicated professionals are here to ensure that everything goes off without a hitch. Our versatility is what sets us apart from other concrete contractors. Not only do we have the ability to work on projects big and small across a full range of applications, but we also have the experience needed to adapt to your job site. We frequently work on new developments and communicate with engineers, developers, and site managers. Or, if your job is in a confined area with minimal space, we can provide concrete pumping. We do what it takes to get the job done! We promise that, no matter the application, the concrete poured by our team is going to exceed your expectations for years to come. We’re licensed, certified concrete contractors in both Oregon and Washington (lic. 200155 and bettsci861rp). Our crew has more than a decade of experience in concrete pouring and construction. We provide concrete services to both residential and commercial customers, no matter the size or scope of the job. Consult with us about your project for a free estimate. We use only the best equipment and tools to produce an exceptional quality of results that exceeds our customers’ expectations. Contact our concrete experts today for a free estimate on your next pouring and paving project. From foundation pouring to concrete stamping, we do it all with a full satisfaction guarantee.